I don’t know about you, but cooking dinner during the work week is tough. I tend to eat bigger lunches, so I can have a light dinner, like a cup of soup or a sandwich. Well I didn’t eat lunch today, and I was hungry, but so tired. I decided to make the most simple recipe, that I really don’t consider a recipe, but a great dinner that is made in about 10 minutes. Plus it is made in one skillet and makes for easy clean-up and it’s enough food to feed a family of four. It is Skillet Tortellini. I am just loving this dish. 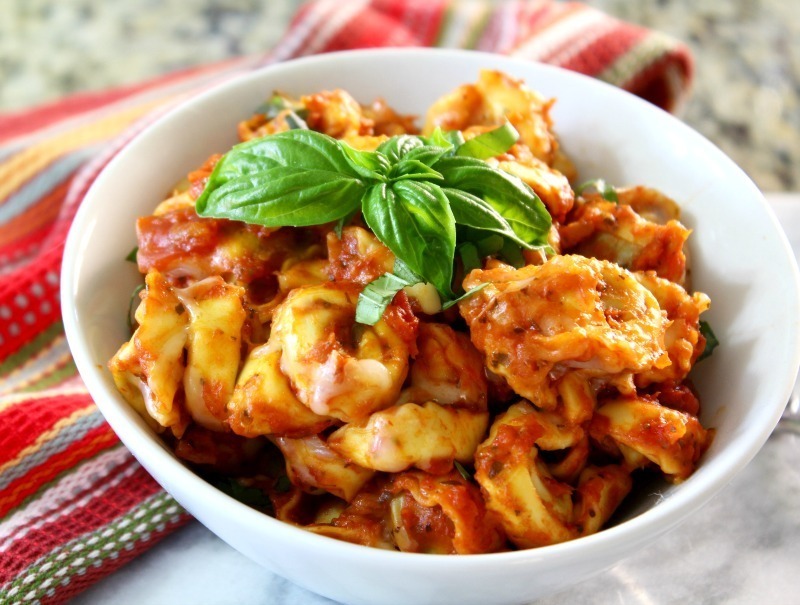 The tortellini is tender and has just the right amount of marinara sauce and it is so cheesy. Perfect for the Italian pasta lover. The recipe is made with 3 simple ingredients; refrigerated spinach tortellini, marinara sauce and shredded mozzarella cheese. How simple is that? 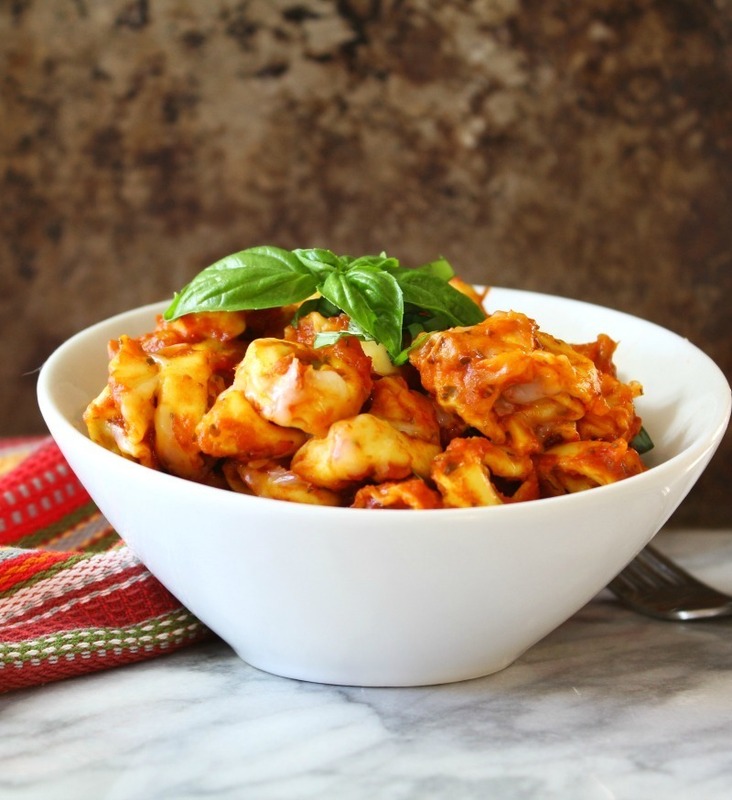 You can easily change-up this recipe with using your favorite refrigerated pasta and pasta sauce. Not a fan of mozzarella cheese? Use Parmesan. The possibilities are endless. I used all Trader Joe’s ingredients. I LOVE their Basil Tomato Marinara Sauce. To make the dish, all I did was warm the marinara sauce, added the tortellini and cook it until it was tender, then topped it with mozzarella cheese. Crazy easy! My dinner was done in 10 minutes. It took me longer to write this post than it did to make dinner. One key thing I must tell you when making this recipe. Use refrigerated pasta. It’s tender and cooks in a few minutes. If you use boxed pasta it will not turn out well. This recipe is made with two 10 oz. packages of Spinach Tortellini. The tortellini I chose has spinach and cheese in it. I have to say I was pretty amazed how well the pasta turned out, considering I didn’t cook it in water. You truly wouldn’t know. 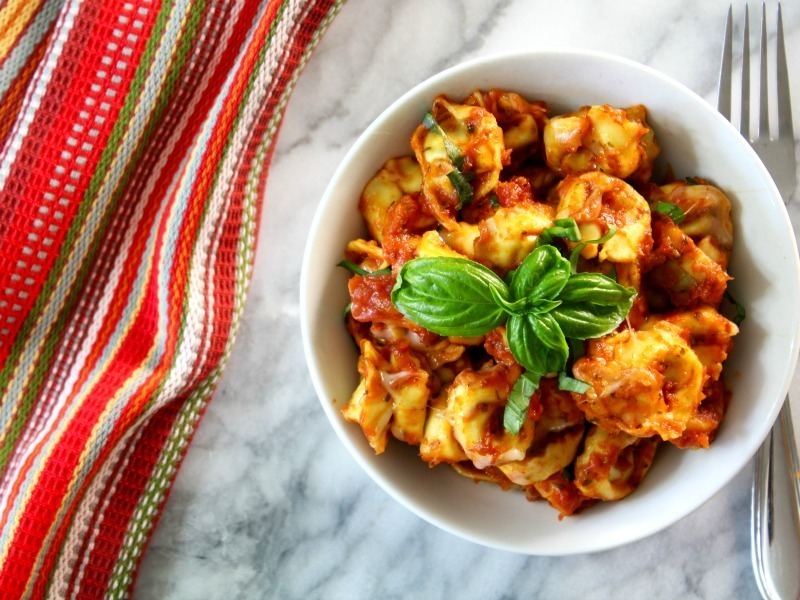 A simple flavorful tortellini made with 3 ingredients and cooked in one pan. Perfect for a weeknight meal and done in 10 minutes. In a large skillet add marinara sauce; warm over medium-low heat; about 4 minutes. Add tortellini and cook for about 6 minutes until pasta is done. Stir the pasta occasionally so it doesn't stick to the bottom of the pan. Top with mozzarella cheese and cover until cheese is melted, about 1 minute. Add basil for garnish if desired. Serve immediately. 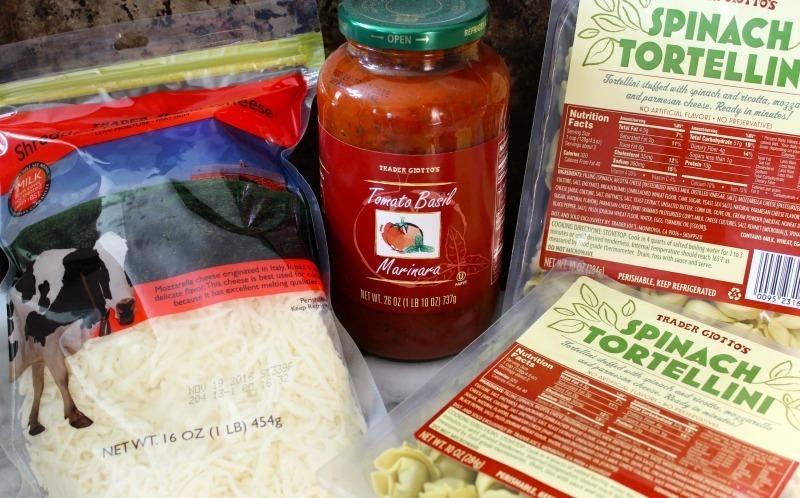 You can use any kind of refrigerated tortellini that you desire. You can also add more mozzarella cheese for a super cheesy dish. I know this was an easy recipe, but we all need to have an easy day and an easy flavorful meal. You can’t beat a family dinner in 10 minutes with one skillet and 3 ingredients. Serve this dish with a garden salad and some garlic bread and I guarantee you will be adding this to your meal rotation. we like meat is there a meat tortellini that would work well with this? 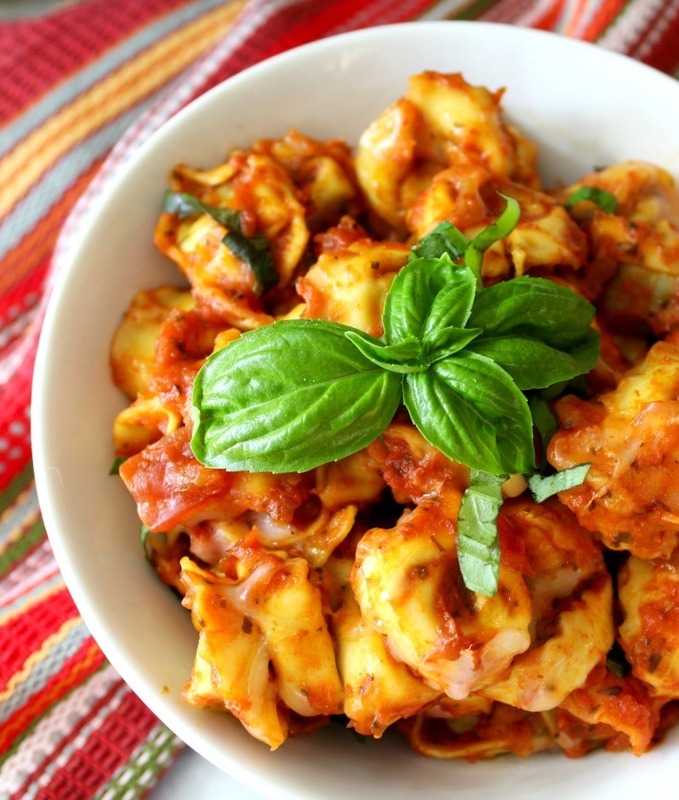 Hi Lonna, any meat tortellini you like will work well in this recipe.